Tony Stewart’s All Star Circuit of Champions kicked off its first season under the Ollie’s Bargain Outlet banner this past weekend at Bubba Raceway Park in Ocala, FL. Stewart’s series is beginning to thrive with young up-and-coming stars. Most of which were present in the pit area over this past weekend’s three race stretch. Action kicked off with a season opening practice session on Wednesday, January 30th. West Virginia’s former NASCAR racer, Cale Conley made sure it was known that he and Dave Jessup’s No. 7k will be up front in 2019 with the help of veteran crew chief, Brian Kemenah, when he turned the fastest lap of the evening. Racing action got under way the following evening with 33 410 sprints signing in for action. Tim Shaffer was the class of the field on Thursday evening, when he won his heat race and finished second in the dash in route to claiming the 30-lap main event. Other heat race winners on the evening included Texas racer and defending series championship car owner, Josh Baughman. Central Pennsylvania All Star Rookie of the Year contender, Brock Zearfoss, and Californians Carson Macedo crossed the line first during their qualifying events. Macedo and Series owner Tony Stewart won the dashes with Pennsylvania stand out Danny Detrich took the B-main win. Wingless sprint car regular Carson Short took overall fast time honors with a lap of 11.484. Shaffer made a pass for the lead around the Lap 19 mark of the 30-lap event before the race’s only caution voided his pass. Shaffer, officially, made the winning move with a pair of laps remaining. Shaffer was followed across the line by Shane Stewart, who was making his debut for CJB Motorsports. 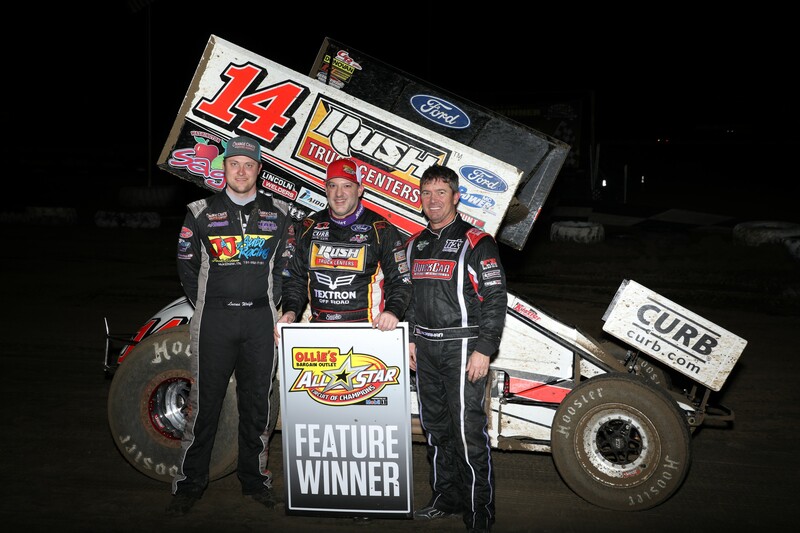 Tony Stewart, Short, and former World of Outlaws Kevin Gobrecht, Rookie of the Year award winner, Sheldon Haudenschild completed the top five. Friday evening was a different story but with the same ending. Tim Shaffer left Bubba Raceway Park on top for the second straight night in a row. This go around, Shaffer set the pace from the 14th circuit on, at which point he had worked the lead from Jacob Allen. Shaffer and Allen were followed across the line by newly-hired rising star and rookie of the year contender, Cory Eliason. Pennsylvania 360 Sprint Car phenom, Mark Smith, was fourth and Chad Kemenah, running a John Garvin/Liz Matus entry, completed the top five. Heat races went to Dietrich, Aaron Reutzel, Kemenah, and Logan Schuhart. Eliason and Allen took a pair of dash wins, while Sheldon Haudenschild won the B-main. Tim Shaffer set fast time with a lap of 11.810. Jim Shuster was uninjured in a spectacular, crash that resulted in him leaving the track in turns three and four. Saturday’s storyline shifted. A heavy afternoon rain storm left the facility in questionable conditions. Many teams that had raced the previous shows opted not to run bringing the car count down to just 25. A locked down, virtually impossible to past, surface allowed Tony Stewart to run from the front and never look back. He was so dominant during the main event that he led by nine seconds, at one point. Stewart’s blistering pace was halted twice. The first came early in the event when Californians Shane Golobic was punted in to the outside retaining wall by an extremely off the pace lapped car, who was retired by All Star officials due to the sequence of events that had taken place. After the restart, the train continued on. Lucas Wolfe made one bid at the lead entering the first turn, but he was unsuccessful. Stewart’s pace wasn’t stopped again until lap 25 when a car slowed on the top side of turns one and two. Stewart then raged on at the front of the parade to win the final night of the Bubba Winter Nationals, over Wolfe, Paul McMahan, Smith, and Shaffer. Shaffer again set quick time on the evening. Heats went to Stewart, Wolfe, and Anthony Fiore. No B-main was run. Action for the All-Stars moves to Volusia Speedway later this week.